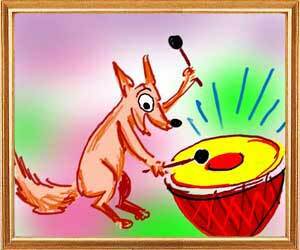 Warily, the jackal marched in the direction of the sounds and found a drum there. It was this drum, which was sending the sounds whenever the branches of the tree above brushed against it. Relieved, the jackal began playing the drum and thought that there could be food inside it. The jackal entered the drum by piercing its side. He was disappointed to find no food in it. Yet he consoled himself saying that he rid himself of the fear of sound. “Okay,” said the king. Taking leave of the king, Damanaka proceeded in the direction of the sound. The king now began worrying himself about Damanaka's intentions. “He may have a grudge against me for dismissing him once. Such persons seek revenge. I should not have taken him into confidence. Let me keep an eye on him. Wise men have always maintained that it is difficult to kill even a weak man who does not easily trust others but easy to kill a strong man who readily trusts others,” the king thought. Assured that what he saw was only a bullock, Damanaka returned to the king and told him what he saw. “Is it true?” the king asked. “All right, I am taking you back as a minister,” said the king, pleased. Damanaka at once hurried back to Sanjeevaka and told him to stop bellowing and come and meet his king. But the bullock wanted who this Pingalaka was. “What? You do not know our lord? Wait, you will know shortly the cost of this ignorance. 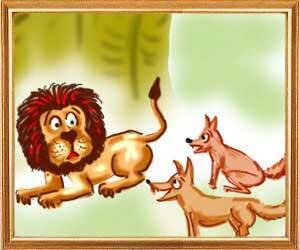 There he is, surrounded by his retinue under the banyan tree.” Sanjeevaka thought his days were numbered and pleaded with Damanaka, “Sir, you seem to be a man of great wisdom and wit. You alone can save me. I can come only if you can assure me that no harm will come to me.” Damanaka told the bullock to wait for the right time to meet the king. “What about Dantila?” asked Sanjeevaka. What is Advaita, or nonduality?